In this paper, we propose an instrumentation and computer vision pipeline that allows automatic object detection on images taken from multiple experimental set ups. 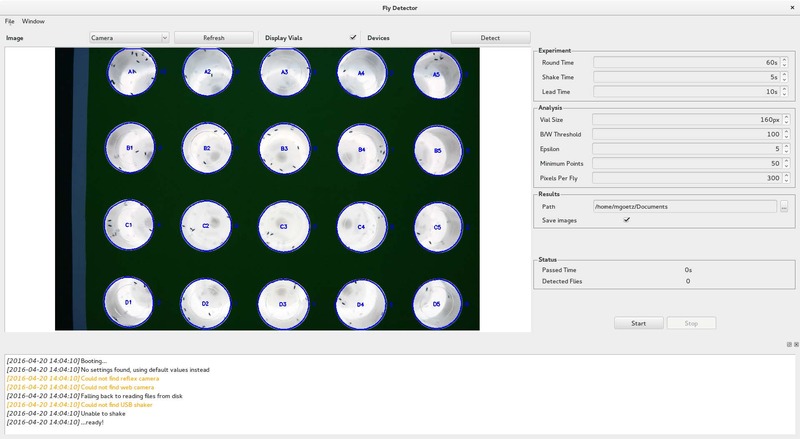 We demonstrate the approach by autonomously counting intoxicated flies in the FLORIDA assay. The assay measures the effect of ethanol exposure onto the ability of a vinegar fly Drosophila melanogaster to right itself. The analysis consists of a three-step approach. First, obtaining an image of a large set of individual experiments, second, identify areas containing a single experiment, and third, discover the searched objects within the experiment. For the analysis we facilitate well-known computer vision and machine learning algorithms—namely color segmentation, threshold imaging and DBSCAN. The automation of the experiment enables an unprecedented reproducibility and consistency, while significantly decreasing the manual labor.